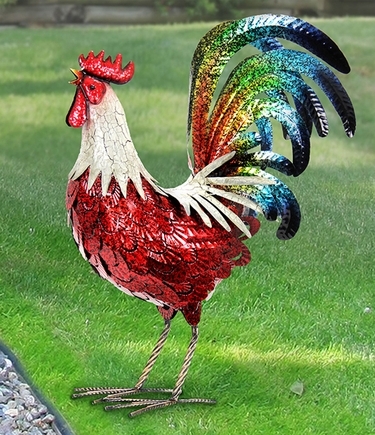 This striking Red Metal Rooster Statue with rainbow colored feathers symbolizes luck and protection, making him a wonderful addition to your garden or landscape! Plus, he'll never crow... now that's a rooster your neighbors will appreciate! Size: 7.75" x 18.5" x 24.25"H, approx 5 lbs., Metal.